November 15 is the day parents take their sons (three or five years old) and daughters (three or seven years old) in exquisite kimono to shrines to pray for their health and growth. ‘Chtose-ame’ is red and white candy sticks. 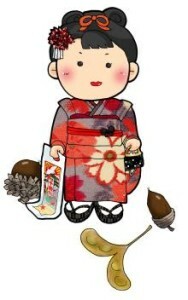 Chitose means “a thousand years”, so eating the candies expresses a wish for longevity.